Distortion Ø is the final party of Distortion. Two days and 6 stages filled with new international dance music. Open: Friday: 16.00-04.00. Saturday: 18.00-06.00. – No beverage, except bottles of water. – No tents, flags, chairs and like. – No video recorders and no cameras with detachable lenses. 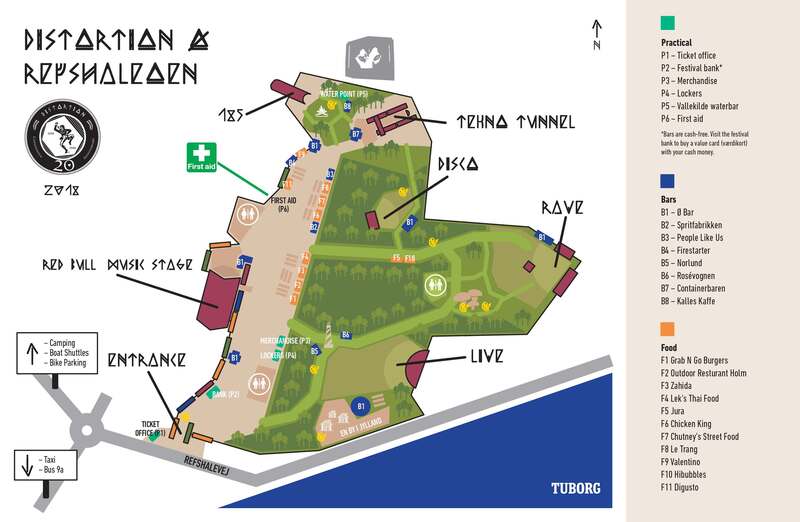 – All attendees will be searched upon entering the festival ground. Live: Lights and visuals by Hackstage. Rave: Concept and design by Ke//er and Ram Schakl. Light design by Berliner Lichtbetriebe. Disco: Deco by Frøken Amager. Red Bull Music Stage: Lights and visuals by Obscura. Site: Atmospheric light design on multiple locations by Studio Reflektor. Experience a small town atmosphere and visit the local bakery, the townhall and listen to the town’s Radio 90,8. Constructions are made out of left over materials. Concept and design by Karavane 908. 90,8 DJs Friday: derMädchen & dasJunge, Musse, Westerby, Rumzar, Mute State, DJ Samson. 90,8 DJs Saturday: 10 Mark DJ Team, Kløvn, Discoshaman, Bendix & Morten Luckow, MorUgle, DJ Dirty Mouth Mouse. The Wavescape Vol2, light installation by Kasia, Lucrezia and Simon. Spatial Augmented Reality, video projection by Matei Petrescu. Enchanted Mysty Hills, oversized mushrooms and chandeliers by AliAla and Reflector. Onboard Spaceship Earth, a pendulum made out of ultraviolet laser by Sean Patrick O’Brien. The Worm Synthesizer, a sound installation with a synthesizer controlled by worms by Lasse Heide Fjordbo. Rotor 3D, light signage by BMJ studio, Jakob Müller & Tobias Rell. Maze to Pink Fire Space, video installation by siGne. Are we made of our…. ?, interactive performance by Culture or Nature. Shadowpaining, installation of TVs by Mikkel Loose.